The Naitional banner o the Philippines (Tagalog: Pambansang Watawat ng Pilipinas) is a horizontal bicolor wi equal baunds o Ryal blue an Scarlet reid, an wi a white equilateral triangle at the hoist; in the centre o the triangle is a gaulden yellae sun wi aicht primary rays, each containin three individual rays; an at each vertex o the triangle is a five-pointit golden yellae starn. This banner can indicate a state o war if it is displayed wi the reid side on tap. The banner's lenth is twice its width, which translates intae an aspect ratio o 1:2. The lenth o aw the sides o the white triangle are equal tae the width o the banner. Each starn is orientit in sic manner that ane o its tips pynts towards the vertex at which it is locatit. Construction sheet o the Philippine banner. The Philippines daes no utilize a separate war banner; instead, the naitional banner itsel is uised for this purpose. This banner is unique in the sense that it can indicate a state o war whan the reid field is displayed on tap, or on the observer's left whan the banner is displayed vertically (i.e., wi the white equilateral triangle at the tap). In times o peace, housomeivver, the blue aurie is the superior field (as seen in the abuin illustrations). Historical examples o this wartime reversal in orientation are durin the Revolution o 1896, Warld War II, an some banners carried bi the demonstrators who stormed Malacañang Palace durin the EDSA Revolution in 1986. Philippine Govrenment "Flag and Anthem" wab page states that the white triangle staunds for equality an fraternity; the blue field for peace, truth an juistice; an reid field for patriotism an valor. The sun for unity, freedom an Fowk Democracy. While the aicht rays o the sun staund for aicht provinces tae revolt against the Spainyie colonizers. [nae in citation given] The three stars seembolise Luzon, Visayas, an Mindanao. The 8 rays represent the 8 provinces that teuk pairt in the initial revolution against the Spainyie. Ambrosio Rianzares Bautista, who wrote the Philippine Declaration o Independence an who read it on the occasion o its proclamation on Juin 12, 1898, haes leetit the aicht provinces as Manila, Cavite, Bulacan, Pampanga, Nueva Ecija, Bataan, Laguna, an Batangas, sayin that thir aicht wur declared in a state o war amaist frae the stairt o the revolution. Historian Ambeth Ocampo haes supportit this, as hae ither soorces. Ocampo haes an aa includit Tarlac amang the aicht leetit instead o Bataan, as hae ither soorces. The seembolism gien in the 1898 Proclamation o Philippine Independence differs frae the current offeecial explanation. It says that the white triangle signifies the emblem o the Katipunan, the secret society that opposed Spinyie rule. It says the banner's colours commemorate the banner o the Unitit States as a manifestation o gratitude for American pertection against the Spainyie durin the Philippine Revolution. It an aa says that ane o the three stars represents the island o Panay, rather than the entire Visayan islands. 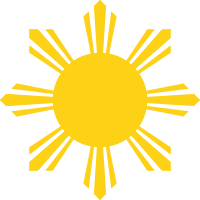 The proclamation an aa declares that the sun represents the gigantic steps made bi the sons o the kintra alang the path o Progress an Civilization, an leets Bataan amang the aicht provinces seembolised bi the sun's rays. ↑ 2.0 2.1 2.2 2.3 "Republic Act No. 8491". Retrieved 2009-06-08. (archived from the original on 2007-12-05). ↑ "Dictionary of Vexillology:C". Flags of the World. Retrieved 2007-06-06. ↑ "Philippines". Vexilla Mundi. Retrieved 2007-06-06. ↑ Renato Perdon (2010). Footnotes to Philippine History. Universal-Publishers. p. 41. ISBN 9781599428420. ↑ 6.0 6.1 Albert P. Blaustein; Jay A. Sigler; Benjamin R. Beede (July 1977). Independence documents of the world. Brill Archive. p. 570. ISBN 9780379007954. ↑ Ambeth R. Ocampo (1998). The centennial countdown. Published and exclusively distributed by Anvil Pub. pp. 162. ISBN 9789712707780. ↑ Ambeth R. Ocampo (1993). Aguinaldo's breakfast & more Looking back essays (2 ed.). Anvil Publishing. p. 65. ISBN 9789712702815. ↑ Stewart Lone (2007). Daily lives of civilians in wartime Asia: from the Taiping Rebellion to the Vietnam War. Greenwood Publishing Group. p. 50. ISBN 9780313336843. ↑ "Philippine Declaration of Independence". Retrieved 2009-06-12. Wikimedia Commons haes media relatit tae Flags of the Philippines. This page wis last eeditit on 14 Februar 2018, at 07:35.